The Rutgers-Camden Community Leadership Center has been invested in the academic, economic, and social progress of residents and communities in Puerto Rico. The devastation from Hurricane Maria in September 2017 has exacerbated the fragile infrastructure of Puerto Rico following the economic recession, bankruptcy, and accelerated population loss within the past decade. The Community Leadership Center is committed to working with its partners in Puerto Rico to devise innovative solutions to revive the educational workforce, particularly through public symposia, joint research projects, and publications. The CLC has a call to action to unite researchers, policymakers, and members of the public to rebuild Puerto Rico and chart its path for a better future. 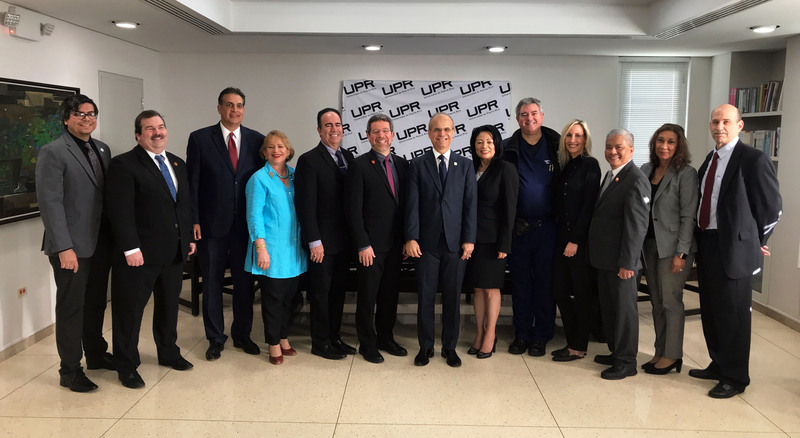 Rutgers, The State University of New Jersey, the University of Puerto Rico and RWJ Barnabas Health signed an MOU to partner, collaborate and create support systems to address Puerto Rico’s present and future challenges post Maria. Under an MOU, the parties will promote and provide for the exchange of scholars and professional staff, the development of cooperative efforts in resources, research, and scholarship for the exchange of students and residents. The University of Puerto Rico is one of the best national leading public universities in the Caribbean in research, excellence in teaching, and commitment to transforming communities. The partnership reflects a long term interest in empowering students and collaborating with faculty to build knowledge and skills in community development to impact the growth and sustainability of the educational and workforce sectors. Health: Improving the health and wellness of individuals and populations, i.e. geriatrics, behavioral health, and women and children’s health, among others. Social isolation has also become a big contributor of mental health, suicide rates, inequality and poverty. Education: Building new pipelines for pre-K-18th through strengthening the public school system through Alianza schools, college access and student success pathways, innovation, engineering and technology to improve SIS systems and civil society, and to address issues of inequality, equity and leadership and management training for a sustainable new higher education system. Public Safety: Rebuilding and improving old infrastructure of buildings, communities, disaster response, violence, trauma, and environmental stress to improve the quality of life of citizens. Food and Energy Security: Generating research projects to address environmental damage on communities, building new micro grid batteries and solar energy, innovating, restoring and reforming the energy system, and securing food production. Page last updated by Community Leadership Center at 11:46 am January 28, 2019 . This page was printed from http://clc.camden.rutgers.edu/puerto-rico/ at 2:42 AM Friday, April 26, 2019.